Bobby Roode makes his way to the ring. He says that he single-handedly sold out the Amway Center and made Wrestlemania weekend glorious. He snuffed out the last star of the old NXT at Takeover, but he’s frustrated with the reception Shinsuke Nakamura received during his farewell speech last week. Nakamura didn’t choose to leave NXT, Roode forced him out. Roode sets an ultimatum: get on board Roode’s new era, or leave NXT. At that, Hideo Itami interrupts and heads to the ring. Itami stares at Roode for a bit, then slaps Roode in the face. Roode takes his time, removing his jacket and preparing for a fight. As Roode talks, Itami hits Roode with a GTS. Itami then takes a look at the NXT title before leaving the ring. Kayla Braxton welcomes Tyler Bate and Jack Gallagher. Jack and Tyler compliment each other and are very polite, but things get a little tense and awkward when they talk about their title match next week. Earlier today at the WWE Performance Center, Heavy Machinery lifted weights. Near them, Adrade Almas briefly confronted Drew McIntyre. I like the match. It was short, but I liked how it developed. Burch started out looking good, foiling a lot of Almas’ attempted moves. Then Almas got angry and came back strong. Highlights and interviews from the women’s division talking about how dominant Asuka is. Everyone is coming for her. Clips of the feud between Tye Dillinger and Eric Young. Pretty good match. It was fun. I really like what Kay and Royce are doing, and Morgan and Aliyah played good foils for them in this match. This was another short match, but I think it will probably lead to more later on. Good match. Eric Young started the match by sending SAnitY to the back, and he and Dillinger had a good battle going. They worked up to where each guy got to do a dive from the top, Young’s being slightly more impressive. Young actually looked really good in this match, and I’m glad he’s the one sticking around NXT for a while. Eventually SAnity came out to the ring and chaos ensued, then Ruby Riot, Roderick Strong, and Kassius Ohno evened the odds. 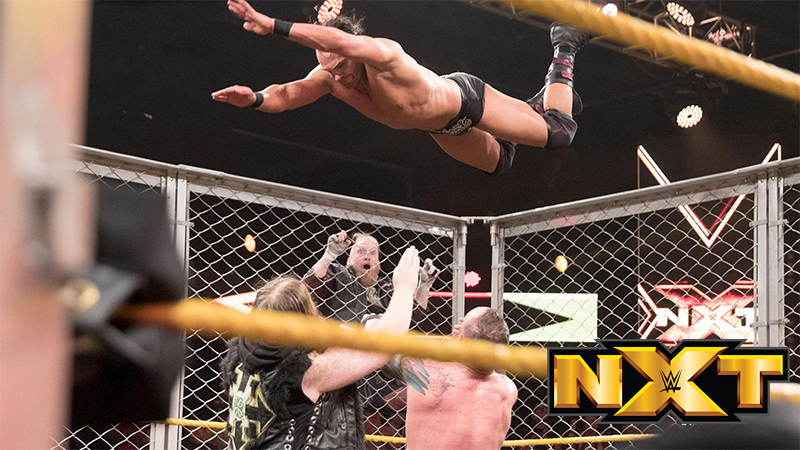 This show felt important because of the cage match, and Dillinger’s NXT exit was easily more exciting than Nakamura’s. This was a good show. Easily the best of the night. This was a good end for their feud, and a great NXT send-off for Dillinger.